What's the San Diego Camp Fair? 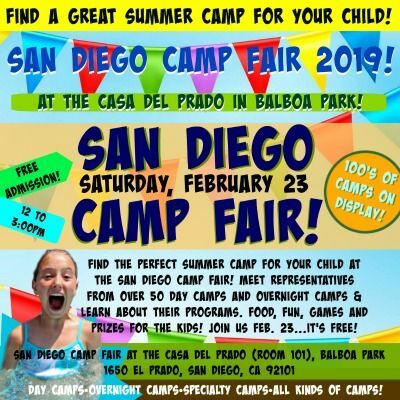 If you're looking for the best summer day camps and sleepaway camp opportunities for your kids this year, you'll find everything you want and more at the San Diego Camp Fair taking place Saturday, February 23 at the Casa Del Prado in Balboa Park. 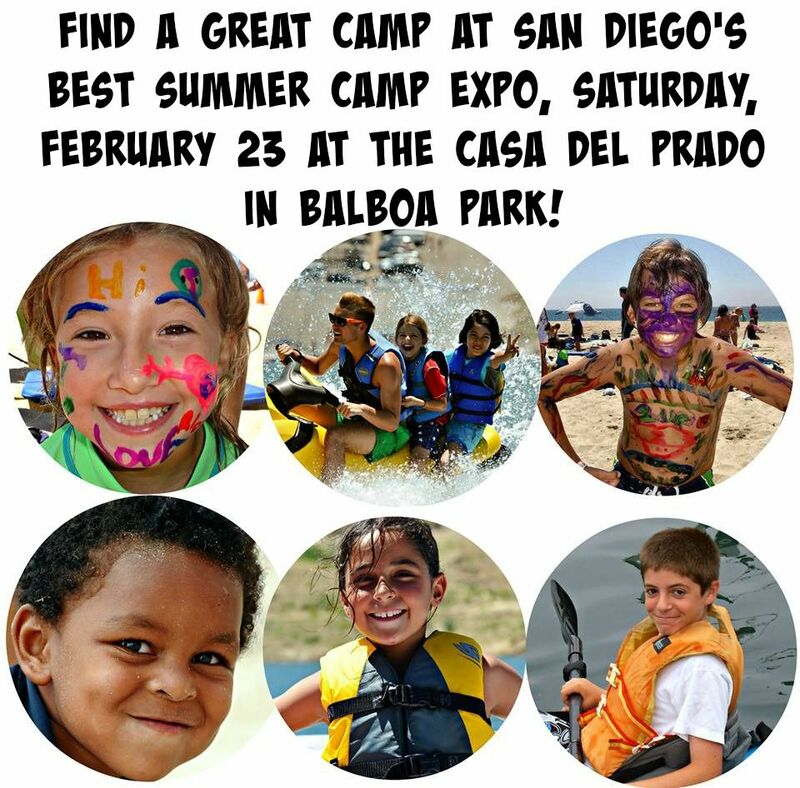 The San Diego Camp Fair is greater San Diego's best summer camp expo and the easiest and most convenient way for find a great camp for your child in 2019! Attending the Camp Fair is the best opportunity for you to meet camp directors, camp counselors and other representatives from local and out-of-state camps in person while gathering brochures, asking questions, and learning about their programs face-to-face. Over 50 of San Diego's top summer camps and programs are coming together to form a "one-stop-shop" to help you find the #1 summer program for your kids this year. Don't miss this fun, free, and informative summer camp expo event! 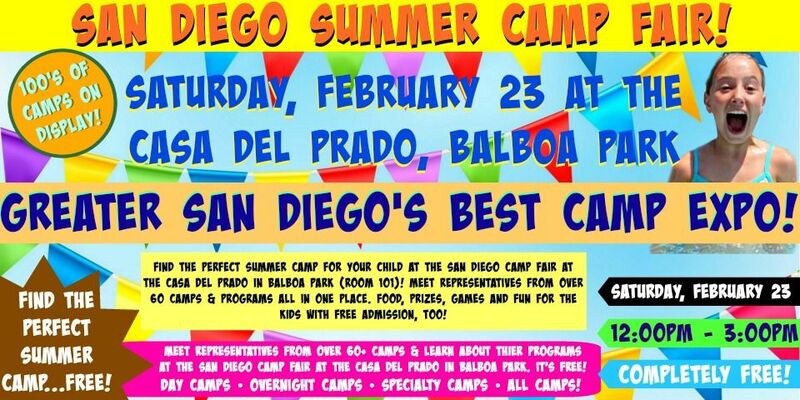 The San Diego Camp Fair is a free, live, and interactive summer camp expo taking place Saturday, February 23 at the Casa Del Prado, Room 101, in Balboa Park. Over 50 summer camp and program exhibitors from San Diego and out-of-state will be on display. Admission is totally free! We hope to see you there! What Can You Do at the San Diego Camp Fair? Discover and learn about dozens of different summer camps, all at the same time, all in the same place! We'll have games, prizes, and activities for the kids, too! The whole event is entirely FREE! What Kinds of Camps Will Be at the San Diego Camp Fair? Whether you're looking for a Mission Bay Watersports Camp, a dance camp in Carmel Valley or an overnight camp out of state, you'll find a dozens (and dozens!) of summer camps and programs to consider at the San Diego Camp Fair. Go booth-to-booth meeting all the camp representatives, collecting brochures and promotional materials, asking questions, comparing camp opportunities and learning about their programs. Day of Event Tip: Spend as much time as you need at each booth getting to know the camp directors to get a really good sense of what your child could experience at each of the camps this summer. No matter what kind of camp you're looking for, you're guaranteed to find it Saturday, February 23 at the San Diego Camp Fair! 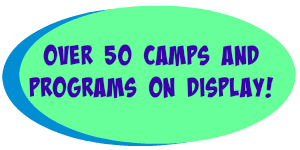 Which Camps are Exhibiting at the Camp Fair in San Diego? Here's a list of summer camps and programs participating at 2019 San Diego Camp Fair. Please be aware this is only a partial list; many more programs are signing up every day to exhibit at the Camp Fair. When all is said and done, you can expect to see at least 50 amazing, unique and affordable program options at the February 23 San Diego Camp Fair. Visit this page often for the most complete and updated list of participating programs. Where Does the Camp Fair Take Place? The San Diego Camp Fair will take place in Room 101 (also known as the Majorca Room) in the beautiful Casa Del Prado at Balboa Park. The Casa Del Prado (pictured below) is an historic reconstruction of a building from the 1915 Panama-California Exposition). It's a beautiful setting for a camp fair! The Casa Del Prado is located at 1650 El Prado, San Diego 92101. Be sure to enter Room 101 when you enter the building. It's the most beautiful setting for an event like this, with lots of free parking, too! (There's numerous free parking lots spread throughout Balboa Park, too, but even if you park further away you can hop on a free tram which will take you right to the Camp Fair location. You can't miss it! How Do We Get Free Tickets? That's a great questions because we're expecting a huge crowd and only have a limited number of free tickets available. Hit the yellow button below for your free San Diego Camp Fair tickets today. And be sure to redeem your ticket at the Camp Fair to be entered into our raffles and drawings for your chance to win free camp sessions and other prizes from participating camps and programs!